Greetings from the Milford Sound….wish you were here! Photo taken in New Zealand’s Milford Sound in November 2004. When we arrived hours later at the Milford Sound, on the South Island of New Zealand, we were pleasantly greeted by this spectacular waterfall. 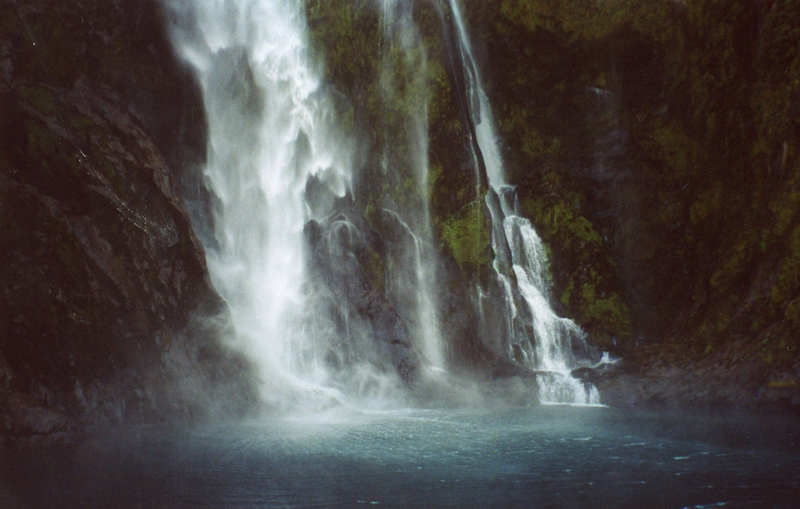 I love how the crashing water causes a mystical splash over the waters of the Milford Sound. It was a place of pure mystique and nothing could have been more fitting than to see this dazzling waterfall before climbing aboard our overnight cruise into the Sound. i like the mist-like quality and the subtle colours!